Most of the zombies in the Walking Dead Mystery Minis line are easy to pin down an origin for; others are... not so much. 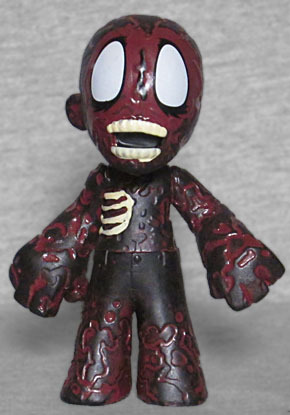 This figure, from Series 2, has clearly been burnt to a crisp, which you'd think would make him easy to identify, but there have been lots of fires burning lots of zombies. Hershel's farm burned, Woodbury burned, the prison burned, the moonshiner's shack Daryl and Beth found burned, Terminus burned, a forest burned, Alexandria burned... fire really is a a go-to for the show. Series 2 came out in 2014, which helps narrow things down somewhat - the latest it could really be is "The Grove," but that's pushing things as far as toy production time goes. McFarlane Toys also released a Charred Walker of their own, and the bio there implies it's one of the ones puposefully set on fire in the pit at Woodbury. Hey, why not? We can live with that. It's not like "deep-fried crispy critter" is so distinct a design that one of them can be picked out of a lineup from the others. The Charred Walker is black on the surface, with a brick red color beneath, just like a properly cooked burger. The sculpt is surprisingly involved, with a dried and cracked skin over the toasty meat beneath and... sorry, I had to take a writing break to make some cheeseburgers and fries. They were delicious, and hopefully will let me focus on finishing this review. 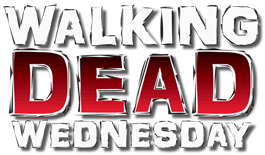 The walker's lips have burned away, leaving only his pearly white teeth, and a chunk taken out of his side exposes his ribs. He only has one ear, the other having been burned away. This mini was available in the most common 1:12 ratio, though just like the RV Walker, there's also a variant available. Well, "available," quote/unquote, as long as you win the 1:172 lottery. 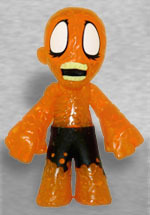 The variant is cast in translucent orange plastic, so he looks like he's still a glowing ember of heat. And hey, it turns out he's wearing pants! Hard to tell when your clothes are the same color as your body.